Each of the two narrow, curled, spongy bones protruding from the nasal cavity walls in the human nose is referred to as nasal concha or nasal turbinate. Covered in thick mucus membrane, the nasal conchae are responsible for regulating the airflow through the nasal passages. 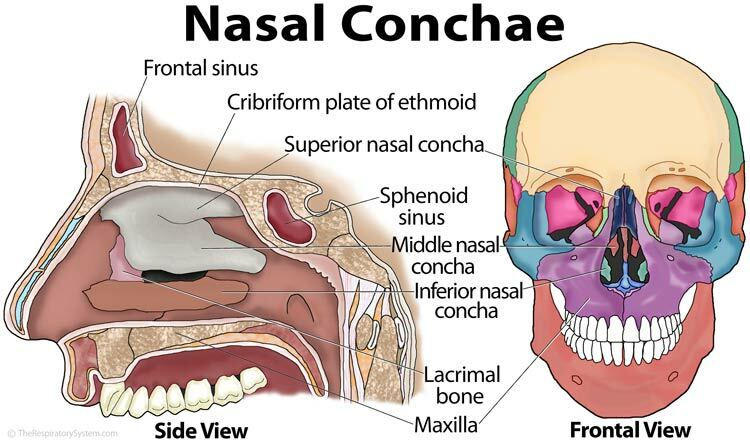 Inferior nasal concha: The largest and lowest of the three turbinate bones , the inferior concha or inferior turbinate is located on the septum, separating the two nasal cavities . 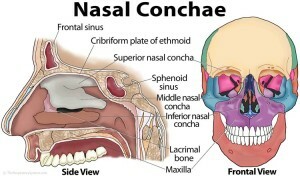 Middle nasal concha: As the name suggests, the middle nasal concha is the bone located between the superior and inferior conchae . Superior nasal concha: It is the small, delicate seashell shaped bone located above the two other turbinates [5, 6]. The superior and middle turbinates both originate from the cranial region of the skull, being considered structural parts of the cranial bones . 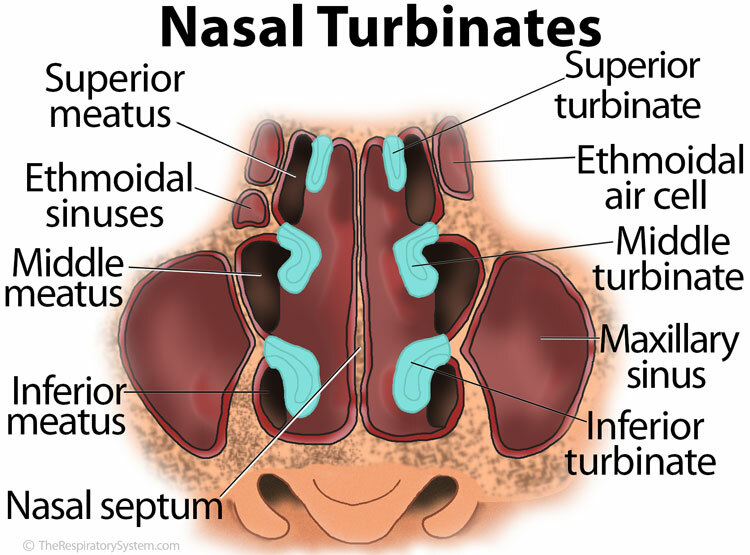 The nasal conchae or turbinates are named this way because they function in a similar way as a turbine, being principally responsible for regulating the air flow during inhalation. The bones expand the surface area of the nasal cavity, allowing the air to come into better contact with the cavity walls. They also slow down the laminar flow of air through the breathing passages, so the air spends a longer time in the cavity in order to be dehumidified . Another function of the nasal conchae is channeling the air entering the respiratory system to go through the mucous membrane and cilia to be filtered and warmed up properly . The inferior conchae are primarily responsible for the above functions while the middle conchae create a protective shield over the sinuses. The superior turbinates serve to protect the olfactory bulb, the structure housing the smell receptors . 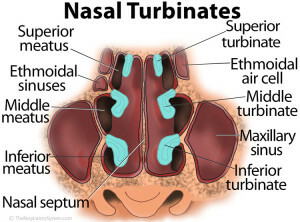 Turbinate hypertrophy is an abnormal condition where the nasal turbinates become inflamed, swollen or enlarged, causing symptoms like breathing difficulty and nosebleeds [14, 15]. Possible causes include cold, flu, allergies, nasal polyps and certain hormonal imbalances . There are various nasal decongestants, antihistamines and nasal steroids that can be used to treat the condition. However, severe cases may call for a surgical procedure for the reduction of the nasal turbinates . I like it , Very clear! Having surgery on enlarged turbinates. Do these tissues continue to grow dispite surgery? This is a 3rd surgery now in my sinus area.